CIE-1931-System is a color matching system. CIE stands for Commission internationale de l’éclairage, which is an international authority for setting standards related to light and color. In this system the goal is not to describe how colors appear to humans but to categorize and measure colors and create a numerically order. Which then also provides a framework for precisely reproducing the measured color in printing or digitally. It’s a mathematical categorization of colors and it’s based on matching combinations of light to colors that appear to most people in this way. Light is transformed in wavelength and humans can perceive these waves in between 380nm and 750nm. Wavelengths are absorbed and reflected by objects. Inside the human eye we have our own system of perceiving this colors by conephotoreceptors. We have 3 of them and they’re sensitive to different but overlapping wavelengths of light. 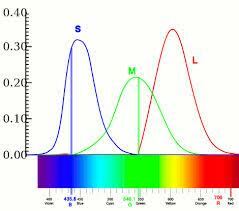 L is most sensitive to long wavelengths and therefor red, M to middle-long wavelengths and therefor green and S to short wavelengths and therefor blue. The cone’s of the eye are stimulated by complex spectral distributions of absorbing or reflecting light and then reduces it to numerical values which represents how much the three cones are stimulated. Important to know is that different spectral distributions can stimulate the cones in exactly the same way. 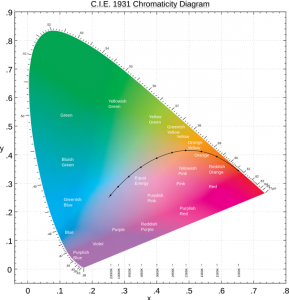 This means we don’t need the original light source to reproduce a certain color but we can create a spectral distribution of light that stimulates the cone in the same way in order to reproduce this exact color if we find the right match. And it’s not only about creating a certain color, but it also deals with showing how to reproduce the difference in brightness of the color. And the CIE-1931-system gives us the information we need to find these matches. The system has 3 functions called the RGB color matching functions. These are three fixed primary colors and the color matching functions are there to show you the amount of each primary output you need to create a desired color when they’re all mixed.